Many people would agree that New York City is one of the top food destinations in the world. Boston is known for its seafood, New Orleans for its Creole and Cajun, and even Rome has pasta. But in New York's Manhattan you will find just about every kind of ethnic food, preparation of food, fast food, slow-cooked food, and food that will definitely stretch your budget. And when you're looking for a romantic restaurant in Manhattan, there's a long list from which to choose. There's no shortage of romantic restaurants in Manhattan. This restaurant, to which New York Magazine readers give a 10 out of 10 rating, is a step back in time to Antebellum New York. A 1854 Gramercy Park townhouse is the setting, its sidewalk tables are surrounded by green shrubs. The quaint parlor, which serves as a casual dining room, is warmed by a real wood-burning fireplace. The second-story dinning room not only has skylights, but also portholes and a stunning crescent window. The menu offers dishes such as truffled mac and cheese and wild boar lasagna, NY strip loin sandwich on toasted flatbread, caramelized onions, and Moroccan lamb mini-burgers. Other menu highlights include oyster truffle duck confit, and the house rotisserie organic Amish chicken. 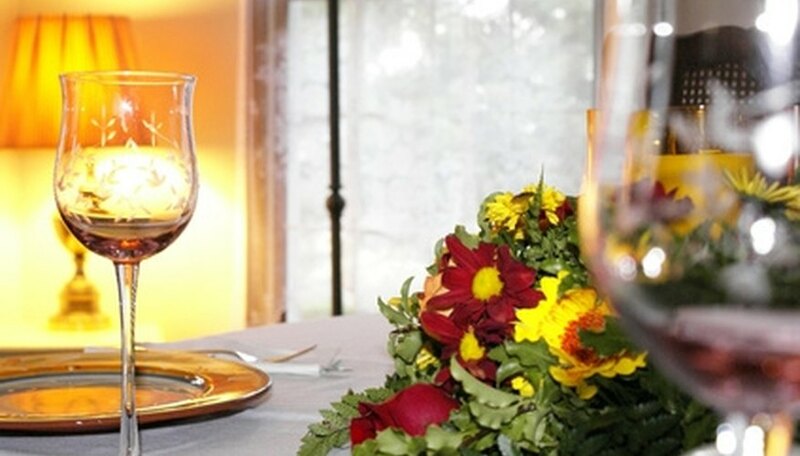 Dinner for two will cost around $50 without wine, and $80 to $90 with it. This is a roof-top restaurant atop Columbia University's main library, Butler Hall, is completely glass-enclosed, giving diners a wrap-around view of of the city. Customers describe the decor as Old World, enhanced by a harpist, a working fireplace, candles and a red rose on each table. Appetizers include late-summer heirloom tomatoes, roasted corn and sherry wine vinaigrette and ricotta cavatelli with rock shrimp, shell beans, ricotta salad and lobster veloute. Entrees includes roasted arctic char with celery root and apple puree, roasted rutabega, Swiss chard and curry oil, cararoli risotto with duck confit, and organic breast of chicken with bacon lardons. Dessert consists of creme brulee, fruit, sorbet and ice cream. A la carte dishes include braised lobster, veal tenderloin, scallops and duck. Scalini Fedeli in Manhattan's Tribeca area has is gracefully upscale, and has soft yellow walls, arched ceilings, wood-framed stained glass windows, and plush carpeting. This Italian/French eatery, whose name means "Steps of Faith," provides large tables that are generously spaced, resulting in a pleasantly low noise level in the room. Copper pots brimming over with apples and oranges are sprinkled throughout the room, giving it a fruity-fresh aroma. This restaurant offers a three-course prix-fixe dinner. Expect expert saucing, skillfully homemade pasta, with Gallic frills like foie gras alongside Tuscan favorites lsuch as porcini mushrooms. The desserts include strawberries in sabayon and a light passion-fruit panna-cotta napoleon. The a la carte menu includes pork chops, monkfish wrapped in prosciutto, braised-pork-and-ricotta ravioli, and black truffle ravioli. Born and bred in New York City, Joan Firstenberg has been a journalist for broadcast, print and online since 1997. Her work has been published by the "Wall Street Journal," Fox News and Bloomberg L.P. She holds a bachelor's degree in communication arts and sciences from The City University of New York's Queens College. Firstenberg, Joan. "Romantic Restaurants in Manhattan." Dating Tips - Match.com, https://datingtips.match.com/romantic-restaurants-manhattan-6049912.html. Accessed 19 April 2019.